When you look at a price chart—whether it be for stock, foreign currency pair, or futures—it seems like it should be pretty easy to make money. Often, when investors first get started, they focus their attention on the big moves and think, "If I had gotten in there, I could have made a fortune." Adopting such a perspective can lead many people to think day trading is relatively easy and a quick way to riches. Day trading can provide significant income if you know what to work on. However, for many people, the required amount of learning and trading practice prevents them from gaining enough experience to become consistently profitable with their trades. Knowing the number of people who are successful versus unsuccessful at day trading will not help you understand why most people fail. It's a challenge to turn a profit through day trading, and although everyday trader believes he can make money, about 95 percent of the people who attempt day trading end up earning a net loss. 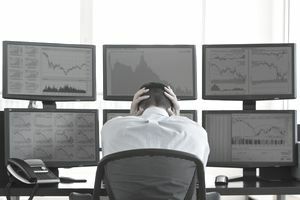 You can improve your odds of profitable trading by understanding the risks that can lead to losses, and getting past the assumption that day trading is easy. A primary reason traders lose money is the absence of a solid trading plan and strategy. Simply looking at a chart in hindsight is not an effective way to create an effective, profitable plan. If you develop a robust strategy, it can be used in all market conditions and will inform you when to stay out because conditions are not favorable. An effective strategy helps prepare you to take action before a profitable opportunity arises, not after. The goal of your strategy is to uncover patterns and trends that point to trading opportunities that could deliver positive returns. You'll need to do research to identify performance factors related to stock or segment of stocks. Without such research, your results might largely be determined by chance. Many novice traders face the obstacle of not understanding that day trading takes a decent amount of time to learn. Many online trading education sites, books, courses, and other resources discuss some of the more prominent trading misconceptions that beginners may have. Putting in a few hours of research without consistently committing time to day trading won't make someone a successful trader. You'll need to practice day trading while maintaining another job unless you have money set aside to cover your expenses for several months or more. It is highly unlikely for a day trader to produce any income from the practice when they get started. Most day traders don't see their efforts result in enough profits to pay themselves any type of income for at least six months to one year from their start date. Numerous issues and situations contribute to making the market difficult to gauge and navigate. Taking the time to learn and understand what triggers shifts in trading activity can better prepare you to respond to those changes. Learn to control your financial risk in case you make a wrong conclusion about the direction of a trade, by putting a stop loss on your trade somewhere. This will give you an opportunity to react if the asset price suddenly drops. Think of it as setting a threshold to help mitigate the amount of money you may lose while pursuing trading opportunities. Understand that you cannot always get the exact price you want when trading, especially with market orders. Heavy trading activity might push a price away from your precise target before you can react. You can choose to skip what might still be a good trade or accept the less-than-ideal market price. Both options will reduce your theoretical profit on the trade. Even if you use limit orders, you may only get filled for part of your order on winning trades (the market runs away before filling the whole order), but you could end up with full positions on your losers (price is moving against you, so, unfortunately, you always get your full order). Understand that the market is entirely composed of other people trying to make money or fend off losses (hedgers). People who are very good at trading look to take advantage of the orders that are placed by inexperienced traders. Veteran traders look for prices they believe allow them to leverage some potential in the asset that others have overlooked and that will provide a good entry or exit point for them. The individual desires and intentions of day traders can substantially influence the outcomes of their efforts. A bit of success can lead to greedy actions that stray from an established trading plan. This can include taking action too soon, holding on to a profitable gain for too long, or not cutting losses soon enough in a losing trade. These and other scenarios can mean losing out on the profits that might have been claimed. Fear can likewise cause a day trader to hold back too much when an opportunity is in the making. They might also sell in a panic in response to breaking news, without taking into account all of the other factors at play. Forming a solid trading strategy has the huge benefit of keeping you focused on your results without being swayed by emotions. Should You Hold a Day Trading Position Overnight?